Constipation or a lack of regular bowel movements, can be a painful condition to experience. Constipation can lead to abdominal pain, stomach cramping, and nausea. Although constipation is not considered an actual medical condition, it is a symptom of many illnesses. The best way to avoid the pain and discomfort of constipation is to avoid the conditions that cause it. Constipation occurs when the movement of food through the large intestine slows or stops. As the food sets in the intestine more and more water is absorbed and the stool becomes harder, drier, and more difficult to push out. This digestive process slow down can be caused by certain illnesses, certain dietary changes, and some medications. While you are treating an illness that causes constipation you will also want to treat the symptom of constipation itself. The same is true if you are on constipation-inducing medications. While you must continue taking the medications you can treat the symptoms of constipation. If you are suffering from constipation you have two choices for treatment. One, you can purchase an over-the-counter medication designed to relieve the symptoms of this condition, or, two, you can rely on natural methods to help you find relief. While many over-the-counter medications will work effectively to reduce your constipation symptoms the added ingredients in these preparations can cause unwanted side effects, and the price of the medications can get out of hand. Also, by relying on commercial medications you run the risk of becoming dependent on these drugs. The best choice for your body and your pocketbook is to rely on natural remedies and substances. These items are easier on the digestive system, cause fewer side effects, and are relatively inexpensive and easy to come by. Now that you know why natural remedies for constipation are so good for you it is time to explore some of the most effective choices. The best natural remedy for constipation is the consumption of fresh fruits and vegetables. By increasing your intake of good for you foods like prunes, oranges, pears, sweet potatoes, green vegetables, carrots, and peas, you can provide your digestive system with adequate amounts of the fibre and roughage its needs to pass stools easily. Another diet change you can make in order to relieve constipation is to increase your daily intake of vitamin C and magnesium. Vitamin C will boost your immune system function and help you fight off any illnesses that are causing the constipation and magnesium has been shown to cause stool softening, which will help alleviate constipation. Other supplements that can help cure constipation include folic acid and apple pectin. A lack of folic acid in the body causes constipation so adding a supplement of this nutrient to your diet will help ward off the condition. Taking apple pectin increases the fibre content in your body and helps balance the function of your digestive system. A great sure-fire way to eliminate constipation is to drink eight 8-ounce glasses of water each and every day. Adequate water intake can help keeps stools moist enough for easy passing and help hydrate the body for normal organ function. If you can't tolerate the taste of water you can add a little fruit juice or one tablespoon of corn syrup to each glass to make the water more palatable. These additions have the added bonus of delivering much-needed nutrients to the intestines. 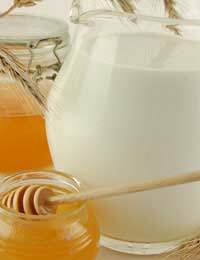 Another easy, and tasty, way to reduce the occurrence of constipation is to add a few tablespoons of honey to a glass of milk. If you drink this mixture twice a day for 2 to five days your constipation should clear right up. No matter which natural remedy for constipation you choose it is important to remember one thing- you should never use any of these solutions for longer than two weeks at a time. If, after two weeks, you are still experiencing the symptoms of constipation, you should see a doctor to rule out other medical conditions and illnesses.